The 1888 American Bank Note Co. Issue in new colors (Scott 215-218) was the last of the Large Bank Note series that spanned two decades from 1870 until 1890, when the Small Bank Note Issue was released. The same plate was used for all 90¢ Bank Note stamps starting in 1870, and the imprint was never changed to reflect Continental or American Bank Note Co. printings. 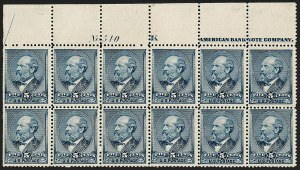 The series of sales of the Colonel Edward H. R. Green collection included two lots described as complete panes of the 90¢ 1888. The first was offered as lot 58 in Part 17 (Harmer Rooke sale, 11/13-18/1944), described as "sheet of 100 (right pane)... imprint #23. Centering fair to very fine, full gum. A beautiful sheet of the greatest rarity. It is remarkable to find that such a sheet is still in existence." The sheet was not photographed in the catalogue. In Part 25 of the Green sales, held by Eugene Costales (2/18-21/1946), lot 511 was described as a 90¢ 1888 sheet of 100 with "Imprint and Pl. #23." Costales, one of the premier philatelic authorities of the period and editor of the Scott U.S. 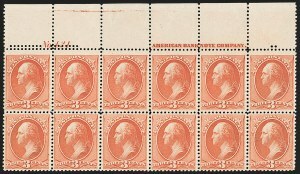 Specialized Catalogue for many years, commented, "We know of only one other sheet of this stamp which does not compare with the brilliance and exceptional condition of this one." This second sheet was photographed in the catalogue. The largest recorded multiple, a top right corner selvage plate block of 20, comes from this second sheet and was offered in our Sale 1092 in 2015. A bottom plate block of twelve, ex Eno, Hetherington and Wampler, also comes from the photographed sheet. 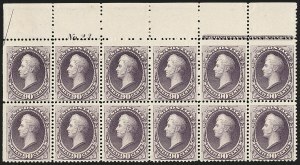 There are two other plate blocks that likely come from the sheet in the Green sale that was not illustrated: the plate block offered here, and a bottom plate block of ten offered in our Sale 869 in 2003.